Patients with dry eye syndrome experience irritated, gritty, scratchy, or burning eyes, often with excess watering and blurred vision. Successful contact lens wear is often difficult. Early detection is important for preserving your eyesight. The Oculus Keratograph 5M uses advanced technology to examine the health of your eyes. 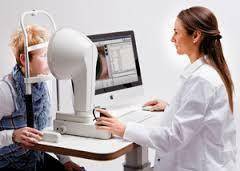 The high-resolution color camera is equipped with intelligent software to analyze the data, as well as compare results and monitor success of dry eye treatment. Schedule your dry eye examination today! Take our Dry Eye Questionnaire to determine if you need a dry eye evaluation.